I don't think that it would be a great leap to assume that most people have had a fantasy about what it would be like to be independently wealthy. Just imagine having the ability to buy most anything that you wanted -- it would be fascinating. But, let's also focus on the "independent" part of independently wealthy. This means that you could also pick and choose when you would work and what kinds of projects you would tackle. There are certainly some people in Hollywood who appear to be in this position. Looking at their resumes, we can see that they appear sporadically and seem to choose certain kinds of tasks. We can assume that Jodie Foster is in such a position, as she appears in about one movie a year, and has only directed a few things. Which makes us wonder what drew here to Money Monster. 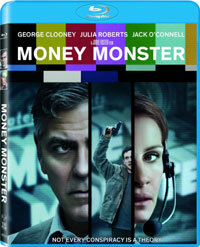 The title Money Monster refers to a television show hosted by Lee Gates (George Clooney). (Which is a not so thinly veiled reference to Jim Cramer's Mad Money show.) Gates is a flamboyant huckster who gives advice on stocks and Wall Street, typically while dancing, yelling, and being surrounded by bold graphics. We join the story just as the show is about to go live and director Patty Fenn (Julia Roberts) is trying to get everything in order. They've got a big show planned, as the company Ibis, which Lee had touted, has suddenly lost $800 million. As the show begins, a delivery man, Kyle Budwell (Jack O'Connell), who appears to be lost, wanders onto the set. Suddenly, Kyle pulls a gun on Lee and demands that the live feed continue. We learn that Kyle lost all of his money investing in Ibis and he's come seeking revenge on Lee and Ibis head Walt Camby (Dominic West), who was supposed to appear on the show, but is now missing. As the tension mounts, Lee and Patty attempt to keep Kyle calm while also digging further into Ibis. Despite the fact that Jodie Foster has appeared in several thrillers (including her Oscar-winning turn in The Silence of the Lambs), this is her first attempt at directing one. Her other trips behind the camera have been either comedies or dramas and this is her first time lensing a movie since 2011's awkwardly-received The Beaver. Foster has always proven herself to be very intelligent and given that she's directed episodes of House of Cards and Orange is the New Black, she clearly likes to remain current. Taking that view, one can see what drew her to Money Monster. The film's take on Wall Street corruption and the plight of the 99% is certainly topical and the film doesn't sugarcoat it's message that the rich pray on the little guy. We also see how Gates dispenses his "advice" with little thought of how it affects his viewers. But, outside of that, Money Monster is a pretty run-of-the-mill thriller. Kudos to the film for quickly introducing the characters and setting up the initial premise, but once this happens, we know that one of two things is going to happen -- Kyle is either going to get away with it, or he isn't. So, we then spend the next 90-minutes waiting for the conclusion. Along the way, the script by Jamie Linden and Alan DiFiore & Jim Kouf does throw some twists at us, but they range from mildly amusing to downright dull. I don't think that anyone will gasp or swoon when it's revealed what Camby has been doing. This twist is unique in the sense that you don't see it in many movies, but it's also needlessly complicated and not interesting. Given that, there are some things which keep Money Monster chugging along. Again, Foster is smart and she's clearly learned from her mentors, as the movie rarely slows down or gets boring. This is a very intriguing role for Clooney, as he starts off being cocky and charming, something we've seen him do a thousand times, but soon finds himself being submissive and scared. He's able to play both very well. Similarly, Roberts is asked to play a character whose ego must be set aside, and she manages to not be annoying. The film's finale plays quite well and offers a biting commentary on how American's view things. While it does touch on hot-button issues, some of the material in Money Monster is quite pedestrian. However, the talent in front of and behind the camera raise the film to a higher level and make it worth a rental. Money Monster is a terrible title on Blu-ray Disc courtesy of Sony Pictures Home Entertainment. The film has been letterboxed at 2.35:1 and the Disc contains an AVC 1080p HD transfer which runs at an average of 25 Mbps. The image is very sharp and clear, showing on overt grain and no defects from the source materials. The colors look very good and the image is never overly dark or bright. The picture shows off a very impressive crispness, and we feel as if we could step into the exterior shots, where the depth is notable. The Disc carries a DTS-HD Master Audio 5.1 track which runs at 48 kHz and an average of 2.4 Mbps. The track provides clear dialogue and sound effects. We get impressive audio in several realms here. For the quieter scenes, the dialogue is always audible. During the finale, the sounds of the throngs fill the speakers, placing us in the middle of the action. These scenes really show off the front and surround mixes.